On April 17th, forty-four alumni returned to Cornell to celebrate the fifteenth anniversary of Last Call All-Male A Cappella's spring show, Straight Up. Act I features performances of hit songs by Queen, Lady Gaga, Survivor and more. In addition, the group shares a clever retelling of "The History of Last Call" through a collection of hilarious skits featuring special appearances by some of history's greatest characters. Act I concludes with a guest performance by an unprecedented forty-four Last Call alumni. 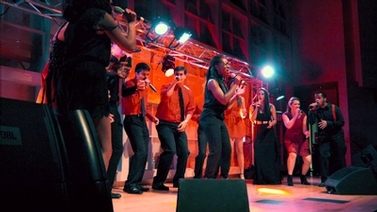 Last Call is an award-winning all-male a cappella group at Cornell University. The group has performed for audiences throughout the country, including an appearance on NBC's Today Show. Last Call recently released Flair, their sixth studio album.